This Benjamin Gifford image is identified as "Eugene Euwer home, Parkdale." Can someone fill us in on this family? Gifford worked in the Dalles between 1895 and 1910. Other sources say Euwer arrived in Parkdale in 1912, so there is a bit of discrepancy in the date of this image. Eugene Euwer was born in 1882 in Elmaworth Pennsylvania, which was a coal mining town. He lived in Bellevue, Pennsylvania later. This is located along the Ohio River. He was married to a Florence Craven and they had an orchard in Parkdale. They had a son named Eugene who worked the ranch after his father and was a Crag Rat. There was a daughter also and think she was a writer. Eugene Courtney Euwer gave up his law practice in Pennsylvania in 1911 to grow fruit in the Hood River Valley. Born Aug 20, 1882 in Pennsylvania, Died Nov 25, 1942 in Hood River. Wife Florence E. Craven Euwer, born Sept 9, 1899 in Pennsylvania, died June 11, 1986 in Hood River. Children: Eugene Courtney Euwer born March 31, 1935 in Portland, Died May 21, 2014; Virginia Euwer Wolff born August 25, 1937 in Portland. Son Gene was a successful orchardist on the family farm/orchard in Parkdale until his death in 2014. Virginia is a celebrated author of young adult literature. The home was a hand-built log home. I need a Parkdale historian to confirm, but I think this house is/was on Culbertson Road. If not it was located off Cooper Spur Road on the East Side. I remember Virginia as a counselor at Camp Yallani when I was growing up. And another daughter is now in HR. Was/is trained as an opera singer and sang in various European operas. She has done one or two presentations locally. I just remember her voice being so powerful it reverberated through your body. Beautiful. Thanks Marin. Gene, who passed in 2014, was a friend to all his Hispanic employes, even visiting them in their native towns. Anad a benefactor to many projects around the Parkdale area. A man who left a hole in the community when he died. House is off Cooper Spur Road 0n the east side. East side. Virginia Euwer Wolfe worked as a teacher at Hood River Valley High School for several years and is also an accomplished violinist. She provided some of the accompaniment to the high school cast when they produced "Fiddler on the Roof" in the 70s or 80s. Eugene Euwer, who recently purchased a place in the Upper Valley near Parkdale, has completed the construction of a handsome log bungalow. Mr. Euwer has also built a barn and will begin at once the development of his tract for orchard. What a great sample of HR valley history to enhance our sense of place here locally and the importance of food production. I relayed this photo to Virginia Euwer Wolff, and her reply was: "This photo, lovely as it is, is not our house. I’d love to know whose it is. Ours is still standing, up the driveway from Cooper Spur Road, 3 miles south of Parkdale, and is still beautiful. But it’s not this house. Others will make comments on the history site, I’m sure, and they’ll clear up the confusion." Thanks, James. It looks like we have one more example of why I treat all the notes in our photo collection with skepticism. I'm still comfortable with the Gifford attribution because it is printed with the photograph. This may clear up the date discrepancy since Gifford's studio in the Dalles operated from 1895-1910, before Euwer arrived in Oregon. It was great to learn about the Euwer family. Now maybe we'll learn about another family when we get a better ID on the home. "Eugene Eurver (sic), of Pittsburg, Pa., has bought 40 acres of the London and Powers place and is going ahead with developing it. He has already contracted for the clearing of 15 acres." 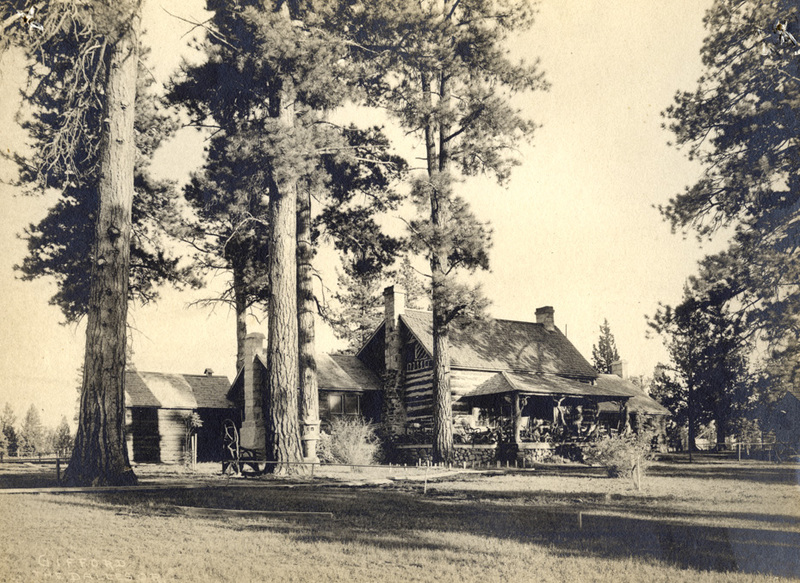 I'm the granddaughter of Eugene C. Euwer, who did build a log house around 1912, off of Cooper Spur Road, near Parkdale. As my aunt Virginia has noted above, it's definitely not this house; there are many extreme differences. This photo might have been taken someplace east of Parkdale. There are a few lone Ponderosa pines among the Douglas and Grand firs in the upper Hood River Valley, but that many together looks like drier country. There is an interesting connection the Euwer family has with a fellow orchardist of the time. Using "Chroncling America" on 4 April 2019, I found that on the day that Gifford and Ellen Uptegrove's second child was born , Gifford was a pall bearer of Marian Euwer. What a day he had. In the Hood River Glacier article on Marian's funeral, the elements of the birth of the child are contained. The Hood River Glacier article states that Marian died of pneumonia which there obviously were no medications for. However that pneumonia was the result of having fought influenza. Influenza is why people along the route to Hood River did not allow Gifford, Ellen and a midwife to enter their homes for Ellen to give birth. Thus, during a snow shower, the second child of Gifford and Ellen was born on the side of road using the back seats of their vehicle as insulation from the cold ground. An Uptegrove version of being born in a manger which for some reason sounds like an upgrade. It is very nice to hear that the Euwer family has lived there for 100 years. An autobiography of Gifford explains the difficulty his wife and he had in returning to the family business in Brooklyn,New York. All who know Hood River can appreciate the Stark contrast between the two places. Please feel free to contact me at my email address if you would like to help me understand about Hood River and the upper valley. The e mail address for John Horton is j.b.horton@hotmail.com. If you want to learn more about Gifford and Ellen and their descendants ancestry.com will supply that information. You can go to any public library to gain access.